Charles II, also known as Charles the Lame, was King of Naples, Count of Provence and Forcalquier (1285–1309), Prince of Achaea (1285–1289), and Count of Anjou and Maine (1285–1290); he also styled himself King of Albania and claimed the Kingdom of Jerusalem from 1285. He was the son of Charles I of Anjou—one of the most powerful European monarchs in the second half of the 13th century—and Beatrice of Provence. 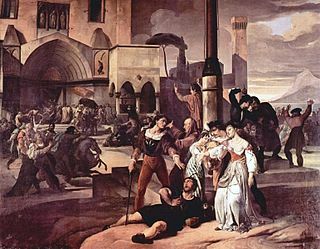 His father granted Charles the Principality of Salerno in the Kingdom of Sicily in 1272 and made him regent in Provence and Forcalquier in 1279. 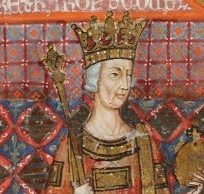 Theobald II was King of Navarre and also Count of Champagne and Brie, ruling as Theobald V, from 1253 until his death in 1270. He was the son of Theobald and the second Navarrese monarch coming from the House of Blois. 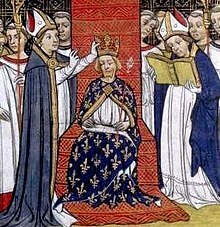 After passing away childless, the throne of Navarre passed to his younger brother, Henry I.
Isabella of Aragon was Queen of France from 1270 to 1271 by marriage to Philip III of France. Mary of Hungary, of the Árpád dynasty, was Queen consort of the Kingdom of Naples. She was a daughter of Stephen V of Hungary and his wife Elizabeth the Cuman. Mary served as Regent in Provence in 1290–1294 and in Naples in 1295–96, 1296–98, and 1302, during the absences of her consort. The Battle of the Col de Panissars was fought on 30 September and 1 October 1285 between the forces of Philip III of France and Peter III of Aragon. It was a severe defeat for the French, who were already retiring over the Pyrenees when the Aragonese fell on them. 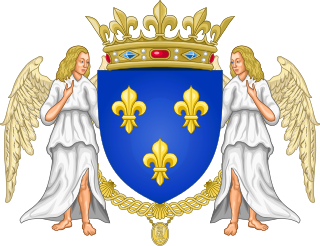 Peter I of Alençon was the son of Louis IX of France and Margaret of Provence. He became Count of Alençon in 1269 and in 1284, Count of Blois and Chartres, and Seigneur de Guise in 1272 and 1284. He was also Count of Perche.